Barack Obama just told Hispanic activist group "Mitú" illegals don't have to be fearful of voting. While speaking with Obama on Friday, Mitú's Gina Rodriguez said: "Many of the millennials, DREAMers, undocumented citizens -- and I call them citizens because they contribute to this country -- are fearful of voting." She then asked: "So, if I vote, will immigration [U.S. Immigration and Customs Enforcement] know where I live? Will they come for my family and deport us?" "Not true," Obama responded. "First of all, when you vote, you are a citizen yourself, and there is not a situation where the voting rolls are transferred over and people start investigating, et cetera." "The sanctity of the vote is strictly confidential in terms of who you voted for," Obama said. 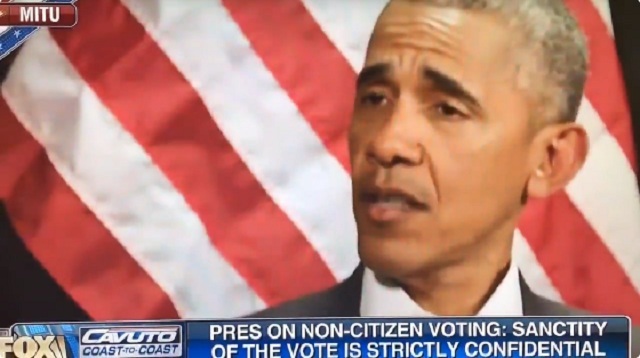 Obama not only encouraged illegals to vote, he let them know they're not going to get caught. In states without voter ID laws, this is sadly the case, and it was done by design. Mass immigration has been, and is being used as a weapon to disenfranchise "native" Americans and rob them of a voice in the country their forefathers sacrificed everything for to build for them. Dems have been stocking the country w/ immigrants to vote for them for nearly 50 yrs. The only question this election: Is it already over?